Agnes Northrop, along with Clara Driscoll, was one of the most important and prolific artists at Tiffany Studios. Hired by Louis Comfort Tiffany in the mid-1880s, Northrop worked for Tiffany's various companies for over 50 years and designed many of Tiffany Studios' most iconic landscape windows. Along with Driscoll, Northrop accompanied Louis Comfort Tiffany on several sketching trips in the United States and in Europe, where they studied architecture, landscapes, flora and fauna. 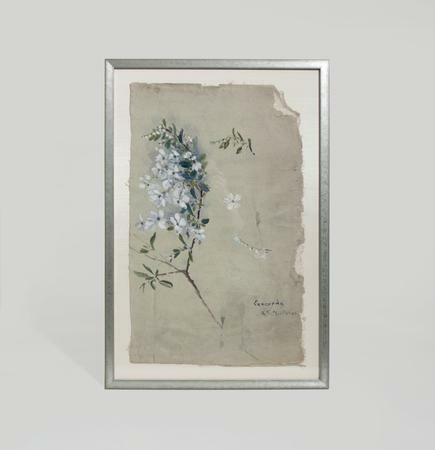 Both in her native New York and on her various trips, Northrop frequently executed watercolor studies of plants and flowers, such as this example, which would aid her in the design of compositions for leaded glass windows executed at Tiffany Studios. 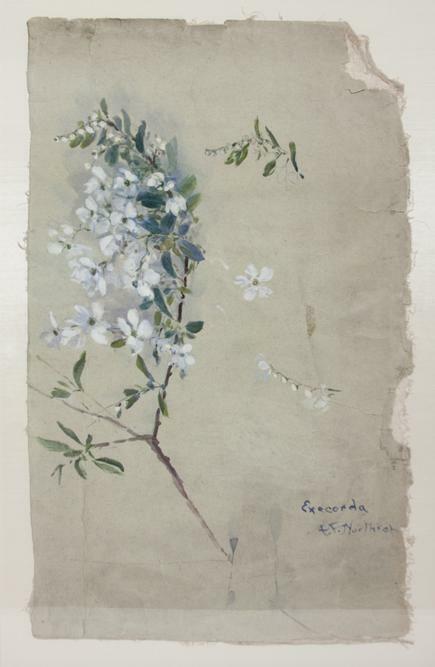 This study of exochorda, also known as "The Bride" pearlbush, captures the buds and blossoms of the flowering shrub in various stages and from multiple angles.